Visit departmental and researchers’ websites. Review posters in hallways near laboratories. Follow up on topics that sparked your interest in lectures and courses. Read general and specialty journals to get a better overview of a topic. Speak to course instructors/professors, teaching assistants and graduate students whose areas of study are of interest to you. Talk to classmates and upper year students — especially those who have participated in undergraduate research including credit courses and summer student research opportunities. Join undergraduate student societies/unions, which often provide information sessions and seminars about research experiences. 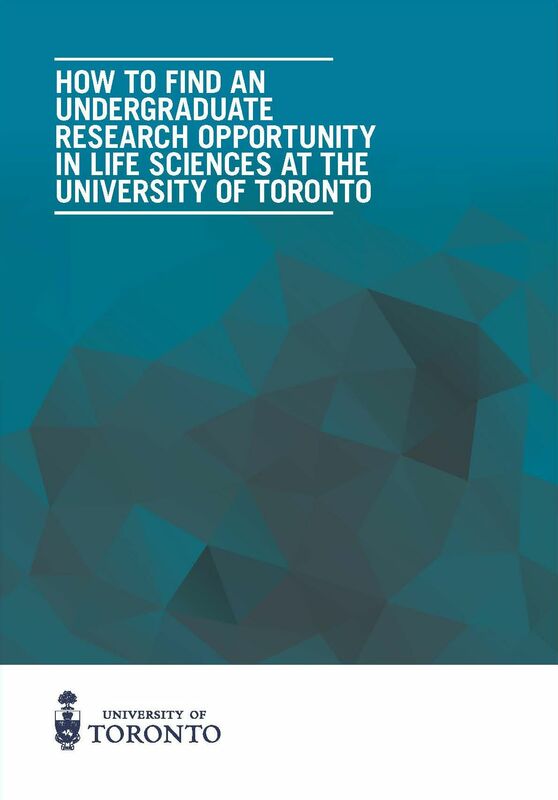 Look for opportunities on departmental office bulletin boards and websites, usually listed under “undergraduate” or “summer programs.” Visit glse.utoronto.ca for undergraduate research opportunities in the life sciences at U of T.
Look for information about research-oriented courses. The Research Opportunity Program, for example, has many research programs for second-year undergraduate students. Check out the Centre for International Experience, Science Abroad for research opportunities abroad. See work-study positions on the Career Centre website. Discover opportunities at affiliated hospitals and their research institutes, and at other national/international universities and research institutes. Visit undergraduate and graduate research poster sessions. Review the U of T Blue Book bluebook.utoronto.ca to find professors. Pick your area of research and start applying at least eight months before you hope to start. It is competitive and there are a limited number of research positions. Send individual messages to professors you want to work with; don’t send mass messages. When contacting professors, include a cover letter that describes your research interests, program and year of study, and career goals. You should show that you are aware of the professor’s field of research. Keep track of application deadlines. Summer research opportunities are often posted in the fall term. Pay careful attention to prerequisites, minimum GPA, time commitments, etc. Talk to a career counsellor about career management, cover letters, resumes and interviews. Ensure your information is accurate and current. Learn all you can about the professor’s research, publications and website. Review interview information, including date, time and location. Bring a notepad and pen, a copy of your cover letter, resume, names and contact addresses of potential referees, and if applicable, a portfolio or samples of your work (e.g., old lab notebooks from undergraduate lab courses). Arrive punctually and turn off your cell phone. Listen carefully and speak clearly. Be ready to talk about any research you have done and your interest in science and research. Follow up after your interview. Some researchers are willing to give you feedback about your interview. Reflect and learn for your next interview. You gain experience from each interview. Don’t get discouraged if you don’t get the position. Science is competitive, but almost all students eventually find a position. Be patient, as it may take professors time to consider all applicants.